If you are a heavier person (over 250 lbs / 113 kg), the fabric might stretch or even rip at the seams. Some users report so. Camping cots provide campers with lightweight alternatives for their sleeping requirements, thus reducing the amount of luggage that you need to carry. Camping also requires the use of compact items, given that campers are limited of space and at the same time, they would like to use equipment that they can keep for a long time. 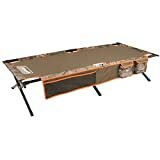 As a camping enthusiast, I know a good cot when I see one and whenever I get a cot with the tag military, I know that it will endure many days of hard use. The Coleman Trailhead II Cot is a military-style camping cot with good length and width, which ensure that you sleep comfortably. Even people who are taller than six feet can use the cot comfortably. The cot is made in the rugged military style. It is also made of a steel frame that will last years of use and will take the weight put on it without buckling. However, make sure that you do not subject it to more weight than it is designed to handle. Its polyester fabric bed will last many washes and many years of use in exposed conditions. The camp cot can hold the weight of up to 300 lbs (~ 137 kg), which makes it ideal for many people. In my many years of camping, one thing I have come to abhor is sleeping on the ground because of the insects and other crawling animals. The camping cot provides you with alternative storage space as it is fitted with side pockets. Its polyester fabric bed will last many washes and many years of use in exposed conditions. The camp cot can hold the weight of up to 300 pounds/137kg, which makes it ideal for many people. In my many years of camping, one thing I have come to abhor is sleeping on the ground because of the insects and other crawling animals. The camping cot provides you with alternative storage space as it is fitted with side pockets. It is sold with one-year limited warranty. The warranty guarantees replacement of the cot in case of manufacturing defects, of course within the guaranteed time of one year. The Coleman Trailhead II Camping Cot provides campers with a lightweight alternative for their sleeping needs. The steel frame is a sturdy long lasting piece of work and the strong fabric promotes durability. You can also use it at home as an extra bed for guests, thus giving it more use even when camping season is over.